Elements | Create. Grow. Encourage. Heal. I am water. Even my sign is a water sign. I love water! My mother says she is solar-powered. She gets her energy from the sun. I love water – I’m hydro-powered. Water soothes my soul. Oceans, lakes, rivers, ponds, water features, the pool – even rain – I love water. When I ponder the qualities of water, I realize I am describing a lot of my qualities – good and bad ways. Water is my element. What of the four elements are you – water, wind, earth or fire? What qualities of your element do you personify? Watercolor – Watercolor crayon (Greens and Blues) washed with very light watered-down gesso. Collage – Images from a magazine too big for page. Extra is left on image. Pen – Sharpie for journaling. 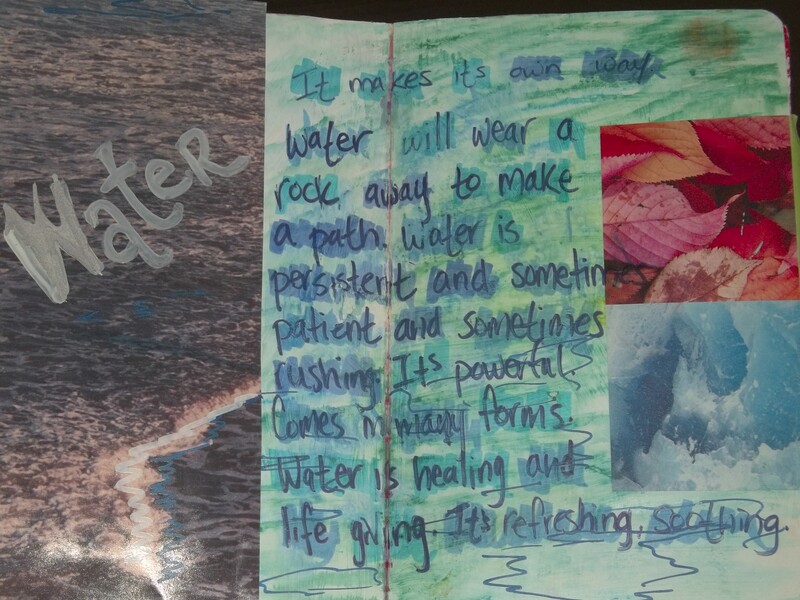 Water-soluble marker under journaling to highlight words. Paint pen on collage elements for detail enhancement.